Publishers are becoming savvier and more strategic in their use of header bidding, a specific implementation of programmatic advertising that allows ad buyers greater access to publisher inventory—even inventory once only set aside for direct advertisers. But in light of this advantage, many advertisers are struggling to understand header bidding, let alone build a strategy around it. Different ad buyers feel the effects of header bidding differently. Ad-buying platforms such as demand-side platforms (DSPs) are actively grappling with issues. Agencies are slightly less influenced, though still keen to figure out how to benefit from it. And while brands may be the least interested in header bidding, that’s not to suggest they aren’t affected by it as well. While header bidding is increasing access to premium publishers, along with their inventory and audiences for all kinds of buyers, the cost of that access—both in terms of rising CPMs and growing volumes of bid activity—is causing problems for ad-buying platforms and agencies. Header bidding allows some advertisers to snag inventory usually offered only to big brands and direct buyers. This is proving a good thing for some, but bad for those hoping to maintain the premium, priority status they had before. As CPMs rise, all buyer types must modify their bidding strategies and advertising practices. But it’s still early, making it difficult to predict how much buyers must now bid to keep winning those impressions. It’s also early days for determining the effects of header bidding on ad fraud. While more direct access to publishers and their audiences has the potential to mitigate ad fraud, other aspects have the potential to propagate it. 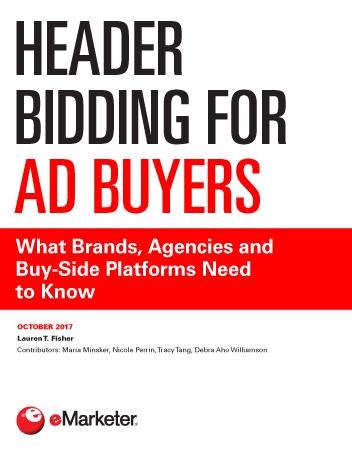 "Almost half of US agency and marketing professionals still don’t understand header bidding, according to a January 2017 poll conducted by Advertiser Perceptions."